The Porsche 718 is an automobile from Porsche released in 1958 and built until 1962. It is a mid-engined race car based on the Porsche 550. Various versions were developed, such as the RSK and the annual updates such as the RS 61. In sports car racing, the 718 RS 60 gave Porsche an overall win at the 1960 12 Hours of Sebring, and several wins at the Targa Florio . In 1961 Masten Gregory and Bob Holbert piloted a 718/4 RS Spyder to a class win at the 24 Hours of Le Mans.The engine was enlarged from 1500 to 1600 cc. In 1963, the Porsche 904 was the successor as sports car. Initially a road-legal sports car with two seats, the 718 was changed first to a single-seater Mittellenker by moving the steering wheel to the center of the cockpit, and later into a real open-wheeler Formula Two car. Due to a rule change limiting F1 to 1500 cc, this 718/2 qualified as Formula One in 1961. Porsche entered the car in several Grand Prix races of the 1961 Formula One season, with mixed results. Four Porsches competed in the 1961 Dutch Grand Prix and finished despite problems, helping to make this race the only GP in decades in which all starters finished. Overall, the 718 was considered too big, too heavy, and down on power compared to the newer designs of the competition that appeared in late 1961, a season which was dominated by Ferrari's V6 156 Dino. Privateers such as Carel Godin de Beaufort entered the 718 in F1 until 1964. The 4th place of Gerhard Mitter in the 1963 German Grand Prix was certainly a remarkable success for a car that was based on a five-year-old road car and the 30-year-old road car engine layout of the Volkswagen, an air-cooled flat 4-cylinder engine. 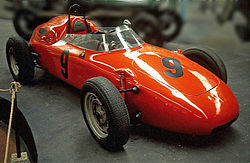 In 1962, the Porsche 804 was the successor for Porsche's factory effort in F1 that was ended after the 1962 Formula One season. Such was the demand for the race prepared RSK718, Porsche decided to sell a version for road use and this was designated the RS60 and RS61.